With so many temples in Singapore, chances are you’ll most likely pass one by mistake when traveling on foot from one location to another. 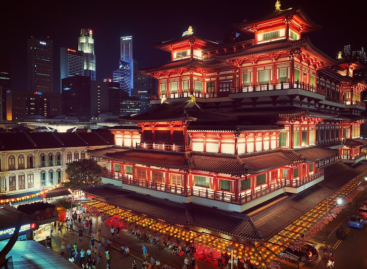 If you don’t want to leave it to chance, then you should get to planning your visit to the best temples in Singapore whether it be for religious reasons or just to get some spiritual inspiration. Most of them are also beautiful architectural landmarks. We have selected 10 of the best Buddhist temples in Singapore and 10 of the best Hindu temples in Singapore to help kickstart your planning. We have not included other religious sites likes mosques or churches as that is an entirely different post all on its own. So get your minds ready with our list of the most beautiful temples in Singapore. It is estimated that 33.9% of Singaporeans are practicing Buddhists making Buddhism the biggest religion in the city-state. Add the 11.3% that are Taoist and it adds up to nearly half the population. With this in mind, there are thousands of Buddhist and Taoist temples throughout the island from tiny side-street walk-ins to massive monolithic structures. No matter what religion you follow, visiting some of the most beautiful Buddhist temples in Singapore will surely calm you down as you stroll through the various structures, which seem miles away from the city. Take your time walking through these temples, being sure not to miss the intricate decorations. Most of the structures are doused in history, so you won’t only be visiting a temple but will learn about Singapore’s unique past. 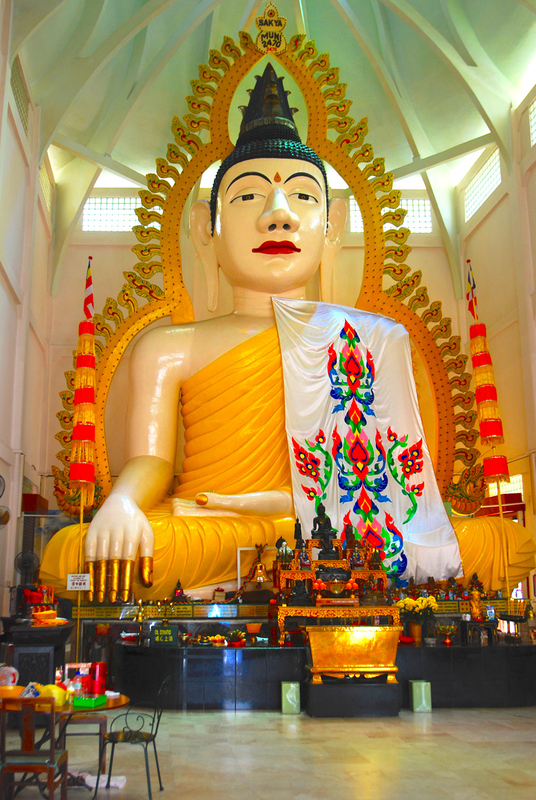 Here are our top 10 picks of the best Buddhist temples Singapore. 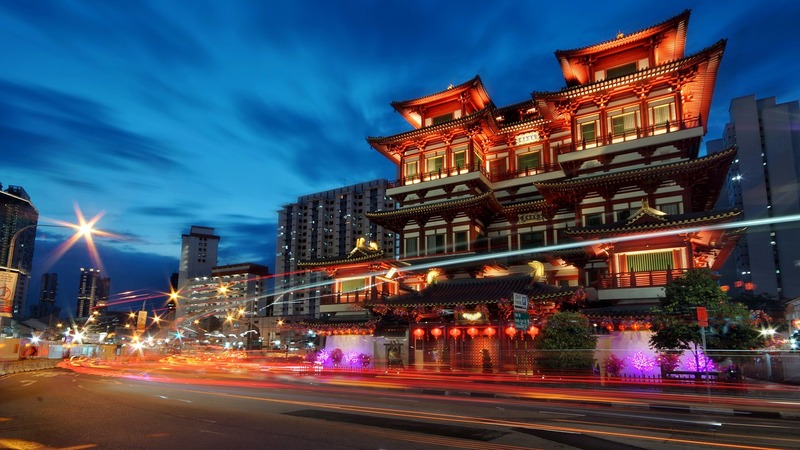 All lists of the most beautiful temples in Singapore must include The Buddha Tooth Relic Temple and Museum. This Buddhist landmark on the outskirts of Chinatown in South Bridge road stands four storeys high and houses what is believed to be Buddha’s tooth. The structure is built in the Northern Chinese Tang Dynasty style which is majestic, grand in stature and methodical in form. It is also one of the newest large temples in Singapore, being completed in 2007, although you would think it was built centuries ago. The interior is intricate with golden and red hues, images and statues of the various Buddhas and Bodhisattvas, and quite spacious. There are tours, classes in meditation and Buddhism and even one day retreats at the temple. The interior also acts as a Buddhist Museum where you can peruse restored ancient artefacts and Buddhist art, making this Museum both aesthetically pleasing and functional. Tourists can view the relic on the top floor of the building after sitting in the same room to meditate. After catching a glimpse of the relic and beautiful Ten Thousand Buddhas Pagoda and the large Buddha prayer wheel on the roof, head down to the basement to get your free vegetarian meal, although a donation is welcomed. With a name that translates to “Palace of Heavenly Happiness”, you’re sure to find some joy at this beautiful structure in Telok Ayer Street on the outskirts of the CBD. Thian Hock Keng Temple was originally constructed as a place of worship of the Chinese sea goddess Mazu (Ma Cho Po) and is an important landmark for the Hokkien people living in Singapore. There is also a Buddhist shrine in the back of the area dedicated to the Mahayana bodhisattva of mercy, Guanyin. Gazetted as a national monument in 1973, Thian Hock Keng is one of the oldest temples in the country with construction finishing in 1842 (even though it was being used as early as 1821). 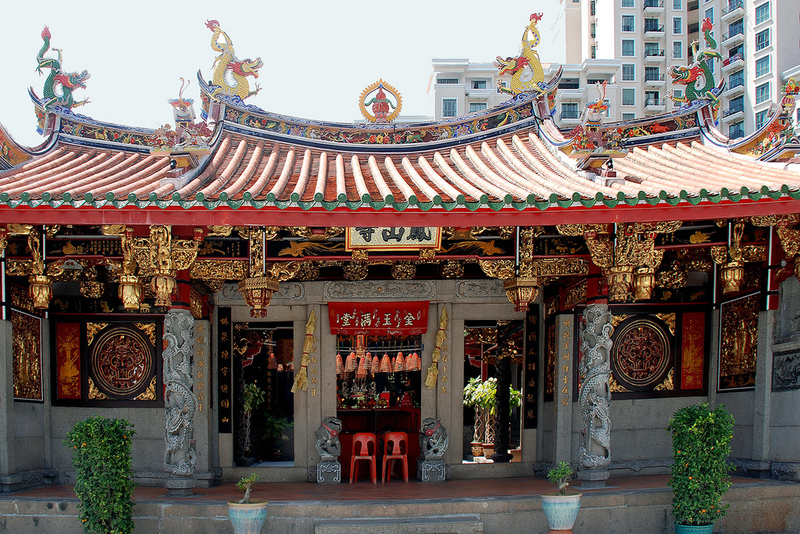 As the temple used to be located on the coastline before Singapore’s land reclamation, it was a place where seafarers would give thanks to Mazu. Some of the columns, timber and even tiles were reused from ship ballasts. After several renovations, the most notable being in 2000, the temple has added a few Western features to its facade like a wrought-iron gate from Glasgow. Yet you will still be amazed by the motifs, statues of dragons, peacocks, lions and door guards, and octagonal pagodas. 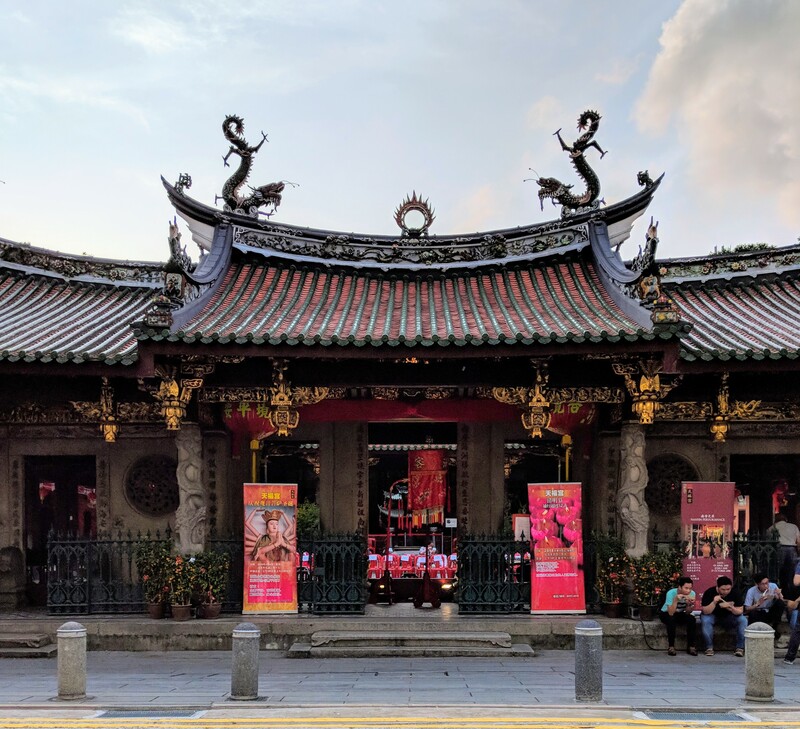 Today Thian Hock Keng is still one of the most beautiful temples in Singapore and stands out as an ode to Singapore’s past showcasing the Red Dot’s cultural diversity. While you can take a virtual tour below, it’s definitely better to go see it in person with a guided tour if you’re looking for serenity among the bustle of the city. 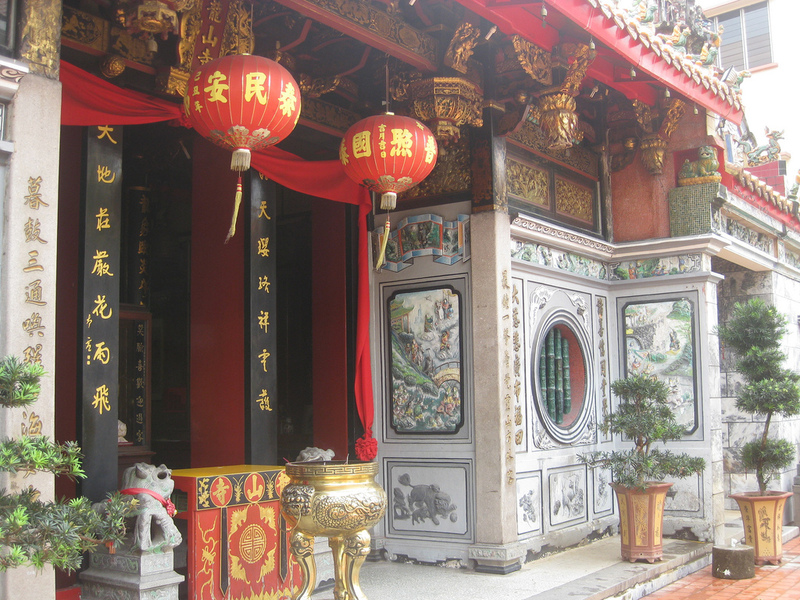 Lian Shan Shuang Lin Temple was founded by a wealthy Hokkien merchant, Low Kim Pong, in 1898, even though its doors only opened a decade later in 1907. Legend has it that Low had a dream of a golden light rising from the west, which is a symbol of the origination of Buddhism, as India stands to the west of China. The next day, Low went to the coast and at dusk met a devout Buddhist family on their way to Fujian. After much persuasion, the family stayed and the head of the family, Xian Hui, became the first abbot of the temple. In 1980, the temple was gazetted a national monument and has gone through various phases of restoration, the most recent being a decade long process and costing over S$40mil. Although the restoration work was a major endeavour, the carpenters, architects and builders tried to keep the authenticity in tact, and have done an astounding job. The temple itself is modeled after the Xi Chan Si Temple in Fuzhou, Fujian province, China and uses the Chinese principles of feng shui to create an inner harmony and flow. The 9m high main gate is already a beautiful work of art and the bronze dragon doorknobs are intricate and make for an amazing photo. 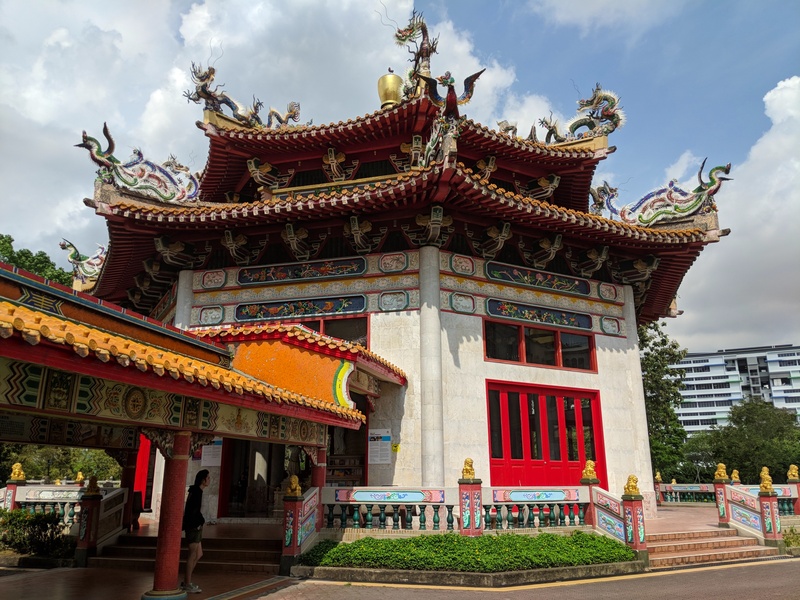 While Lian Shan Shuang Lin is situated in Toa Payoh and is an off-the-beaten-path temple in Singapore, it is definitely worth the visit. Here are some videos to get you inspired. A good idea would be to combine your visit with a nature trek in nearby MacRitchie Nature Reserve to continue your enlightened mood. Sharing a name with the road in which it is situated, Bright Hill Temple is a working monastery where monks may lodge and is the largest Buddhist temple in Singapore. It is located in Bishan, so it is very close to Siong Lim Temple and MacRitchie Nature Reserve. With humble beginnings and land donated by Tay Woo Seng, a Chinese businessmen, Bright Hill Temple has grown into the most important prominent Buddhist educational institution in the country with a Dharma School for children interested in learning about the Buddhist path. There is also a six-storey Buddhist college for monks. It is gigantic in structure and contains prayer halls that are as large as ten football fields. The most notable feature, other than the sheer size of the monastery is the massive bronze Buddha statue, located in the temple’s Hall of No Form, and is one of Asia’s largest. It stands at a height of 13.8 metres and weighs 55 tons. You can also sit under a bodhi tree imported from Anuradhapura, Sri Lanka by way of Bodh Gaya, India which is the place where Shakyamuni Buddha was said to have attained enlightenment. The monastery also acts as a crematorium and columbarium (place where urns are stored), so please do take note of any services that may be taking place on your visit. It’s always best to call ahead, where you can also book a guided tour. If you’re driving there, no worries, there are over 200 parking bays. Here is an easily accessible temple to add to any Singapore tour. Located in Waterloo Street in Bugis, you will find various other religious institutions nearby, like the oldest synagogue in Singapore, Maghain Aboth, as well as the Sri Krishnan Temple which is mentioned later, the Church of Saints Peter and Paul, and Malabar Jama-ath Mosque. Bugis truly showcases Singapore’s open-mindedness when it comes to acceptance of all faiths. 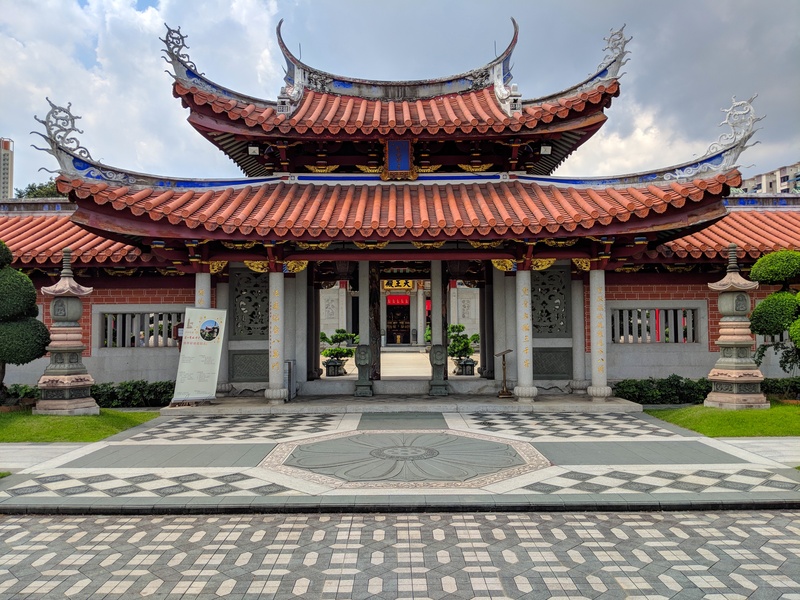 As Kuan Yin is a traditional Chinese Buddhist temple in Singapore, you will find the usual curved decorated ridges on the roof and gate displaying swastikas in yellow, green, red and blue. While the facade and interior are not the most splendid representation of Buddhist temple architecture, Kuan Yin is the most visited temple in Singapore where devotees come to pray to health, wealth and prosperity on a daily basis. If you’re willing to brave the crowds, then plan your visit on Chinese New Year where thousands pack the street in line to offer incense to Kuan Yin (or Avalokitesvara, Goddess of Mercy) in the hope of gaining an auspicious start to the new year. Whether you’re there for an event or just to visit, make sure to offer an incense stick (S$2 at a vendor outside) to the Goddess of Mercy or make a donation. The temple is also a patron of the arts and provides a variety of charitable works including an educational bursary program and donations to the National Kidney Foundation Singapore. 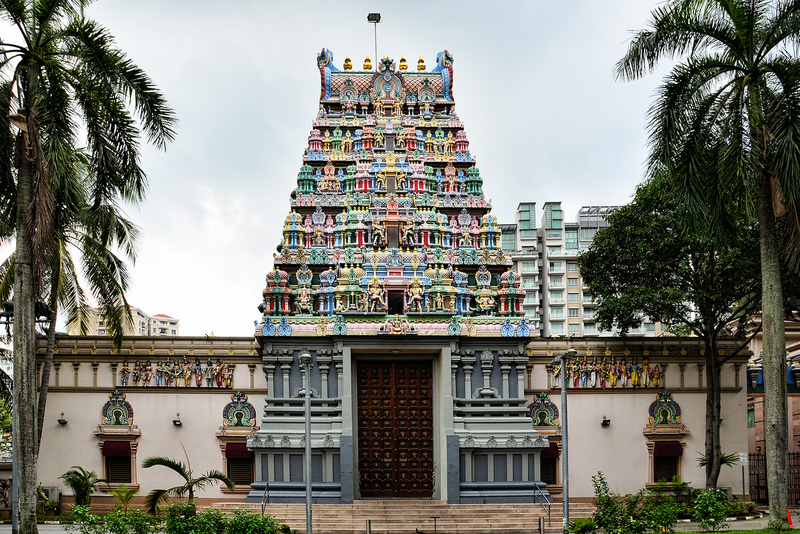 Visitors exploring Little India should definitely pop into the unassuming yet beautiful Leong San See Temple about a 10min walk from Farrer Park MRT. Translated as “Dragon Mountain Temple” from Mandarin, the small Buddhist temple in honour of the Goddess of Mercy was opened in 1917 and established by monk Reverend Chun Wu. The most remarkable aspect of the building is its ornate golden roof which holds dancing ceramic dragons amid an ocean of colourful characters. There is a giant statue at the entrance of a heart-shaped golden padlock lock and depicts imagery of a phoenix and dragon. Inside there is a large statue of Confucius and various incarnations of the Buddha and other Buddhist deities. Visit Leong San See for a quieter, more tranquil time in a quaint, yet charming setting. The temple is not to be confused with Hong San See Temple. It is also located directly across the road from the Temple of 1,000 Lights, so you can kill two birds with one stone on your visit. Almost directly adjacent to Dragon Mountain Temple is the larger and more noticeable Temple of 1,000 Lights or Sakyamuni Buddha Gaya Temple. With a similar story to Dragon Mountain, the temple began as a shelter when a Thai monk, the Venerable Vutthisasara, arrived in Singapore in 1927 and erected a temporary shelter made of zinc and wood to house a statue of Buddha that he had carried on his travels. The name refers to the Buddha and is also known as Shakyamuni or Siddhartha Gautama. After becoming popular, a temple was erected in 1930 when the Haw Par brothers made a large donation. The nickname, Temple of 1,000 Lights, comes from the seemingly infinite string of lights that surround the 300-ton Buddha statue creating a magical aura. There are also an array of images depicting the various stages of Buddha’s life. Uniquely Singaporean in its mix of culture, the temple is an eclectic blend of Chinese, Thai and Indian architecture, although mostly Thai. Temple of 1,000 Lights also houses a piece of bark from the original Bodhi tree under which Buddha sat and a replica of what is believed to have been Buddha’s footprint. Opening hours: 8.00 am and 4.45 pm daily. This is a very special temple in as it is the oldest Theravada institution as well as being the only Burmese Buddhist temple in Singapore. Founded in 1875 by U Thar Hnin (Tang Sooay Chin) and originally situated in Kinta Road, the temple moved premises in 1988 to its current Tai Gin Road location in Novena, just under Toa Payoh and a stone’s throw from Lian Shan Shuang Lin Monastery. The architecture is also quite unique, as Maha Sasana Ramsi is the only temple outside of Myanmar to be built in the traditional Burmese architectural style. Even before you enter the temple you are struck with the glittering golden facade that draws you in. When you enter the main meditation hall, you will be transported to another dimension at the sight of the mammoth 3m marble Buddha statue. 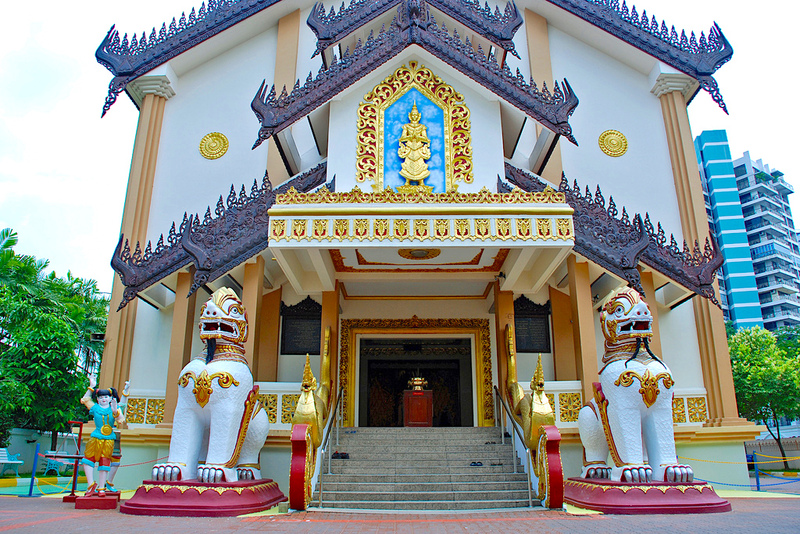 The tiered roof is made from imported Burmese teak and is adorned with wood carvings. There is also a golden pagoda on the roof which acts as a meeting place for religious discussions and ceremonies. 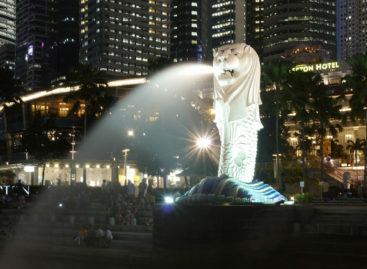 The statue was no easy task to get to Singapore. The marble is from Sagyin Hill in Myanmar, known for its superior quality marble. It was an arduous mission, but the intact and completed statue arrived in Singapore unharmed in 1925 thanks to the financial assistance of Aw Boon Par. This is the main reason to visit the temple, where you can practice vipassana (insight) meditation to gain that inner calm before entering the city. There are also weekly Dharma and Abhidhamma classes to join. Visit during Thingyan, the Burmese New Year (usually mid-April), for a host of festivities. If the temple inspires you to visit Myanmar, then don’t forget to save our itineraries for Mandalay and Inle Lake. Not to be confused with Leong San See, Hong San See is located at Mohamed Sultan Road in the River Valley Planning Area at the top of a flight of stairs. The name means Temple on Phoenix Hill and is dedicated to Guang Ze Zun Wang, the God of Fortune. The temple was gazetted as a national monument in 1978. Originally located in Tanjong Pagar, the temple found a new home after receiving compensation from the government and was completed in 1913. It was placed in its current location due to good feng shui, as it was on top if a hill and overlooked the ocean. While the ocean view is now blocked by expensive high-rise buildings, it still remains perched up high where visitors must climb a small set of stairs to reach it. The granite columns at the entrance are intricately carved with entwined dragons and are very beautiful. The interior columns are just as exquisite with carvings of peony flowers, magpies and phoenixes. The phoenix motif extends to various parts of the temple such as the black doors with gold painting. There is an open-air courtyard to stroll in contemplation and verses written by the late Pan Shou, a Singaporean calligraphist. Combine your visit with a stroll to Fort Canning Park for some added tranquility. Here is something a little different from the rest of the cultural heritage monument temples. Wat Ananda Metyarama is a Thai Buddhist Temple that is more like something out of a sci-fi movie than a Thai Theravada monastery. The futuristic look stands far apart from any Buddhist Temple you’ve ever seen. Even though Wat Ananda is the oldest Thai temple in Singapore, it constantly aims to keep up with the times and tries (and succeeds) to capture a younger audience interested in Buddhism. The S$6mil V-shaped five-storey building designed by Czarl Architects is a testament to its constant adaptation to the changing times. 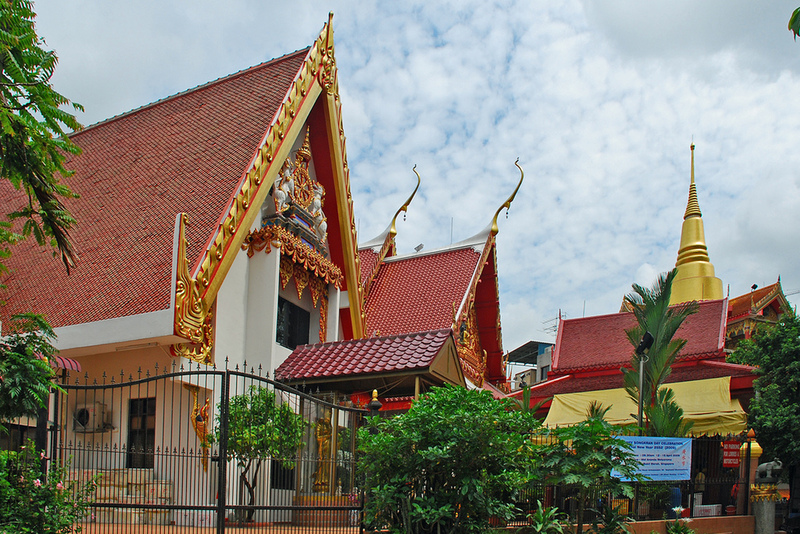 While the extension in the front may attract a younger, hipper crowd, the golden pagoda at the back of the structure is in the typical Thai Buddhist architectural style. The new building also holds a Cultural Centre (Museum) containing Buddhist artefacts from around SE Asia. If you would like to do more than visit, you can volunteer to help the temple out with a variety of different activities. 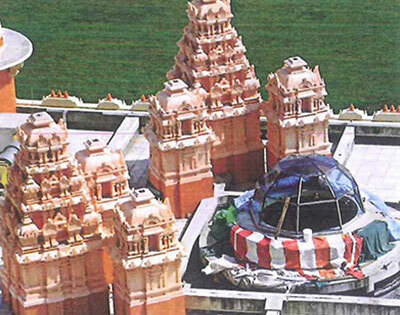 Most Hindu temples in Singapore are designed using the south Indian Dravidian style. This means that you will encounter gigantic gopuram (tiered entrance passageways) depicting scenes from Hindu folklore in a multitude of bright colours. There are also murtis (statues) of the Hindu deities to whom the temples are dedicated. So be prepared to witness the vibrancy of Hinduism, particularly from a Tamil and Chettiar perspective, where the statues almost come to life. Be sure to check out dates of the major festivals before you go as you may not want to spend time among thousands of devotees. But then again, it may be a once in a lifetime opportunity to engulf yourself in a vibrant culture and to experience something new. 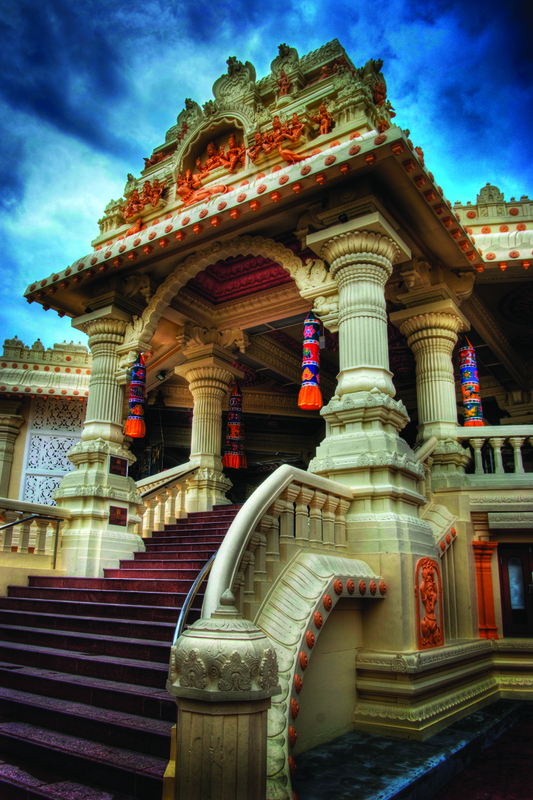 Here is our list of the most beautiful Hindu Temples in Singapore. Sri Mariamman Temple is the oldest Hindu temple in Singapore. It was gazetted as a national monument in 1973 and has become a favourite tourist attraction among visitors. 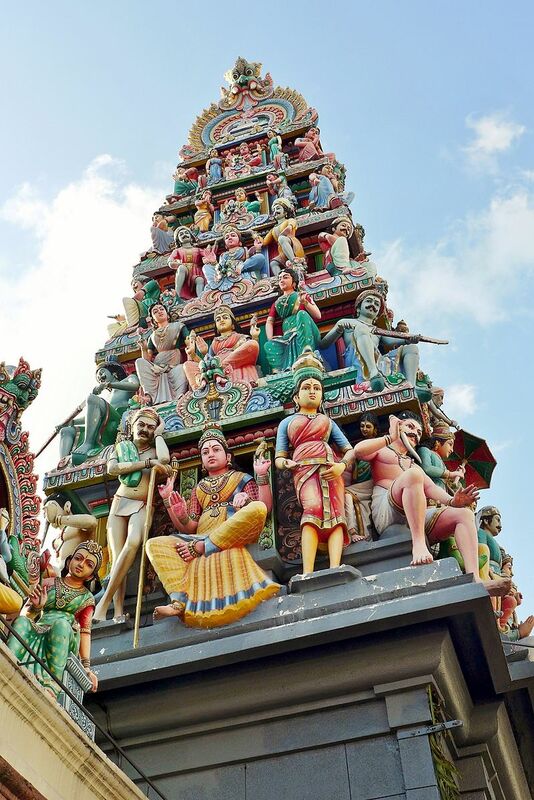 Sri Mariamman Temple was founded in 1827 by Penang government clerk Naraina Pillai who arrived in Singapore with Sir Stamford Raffles in May 1819. It was originally a place of refuge for South Indian Tamil Hindus immigrants and provided shelter until they found permanent employment and homes. Today, the temple serves the majority Hindu Singaporeans, Tamilians, in the Red Dot. The agamic temple follows the Dravidian style, which means it has a high and intricate gopura or gatehouse at the entrance. The gopura, seen from South Bridge Road in bustling Chinatown is most likely the most photographed of all the Hindu temples in Singapore. It has six tiers of Hindu deity sculptures, including other figures and ornamental decorations. On either side of the gopuram there is of a sculpture of Murugan on the right and Krishna on the left. There are also seated cow sculptures surrounding the walls. Upon entering the interior, don’t forget to look up at the grandiose mandala painting and the various shrines throughout the complex displaying important deities, gods and scenes from the Hindu epics like the five Pandavas from Mahabharata. Don’t only go for the beauty, but soak in some culture, particularly during the annual timiti (firewalking) festival, held roughly a week before Deepavali or the Festival of Lights. During the festivities you will be able to watch the devotional souls walk on piping hot coals with their bare feet. There are also free Thevaram classes, free homeopathy services and the temple provides bursaries to Hindu students from low-income families. Adjacent to the Kwan Im Thong Hood Cho Temple in Waterloo Street is the Sri Krishnan Temple. Due to its proximity to Kwan Im, Chinese Buddhists would enter the compound and light joss sticks. For this reason, a statue of Guan Yin, the Goddess of Mercy, was placed at Sri Krishnan. This makes Sri Krishnan a symbol of the harmony within the multi-religious and multi-cultural society that is Singapore. The temple started with humble beginnings in 1870 when Hanuman Beem Singh placed an idol of Sri Krishna under a banyan tree on Waterloo Street. From then on additions were placed by his successors. It was later managed by notable Singaporean V. Pakirisamy Pillai and then his son Sivarama where the final renovations were carried out in 1984 and the Mahakumbhabishekam or consecration ceremony was held. 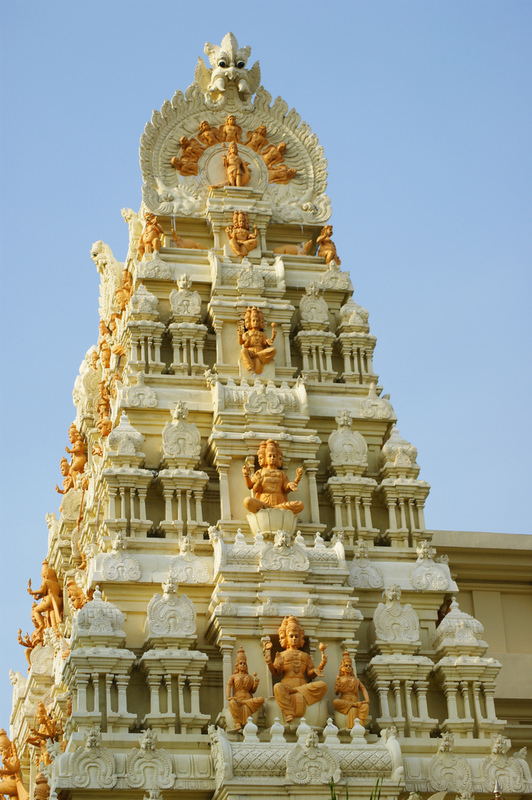 The temple stands apart from the other Hindu temples as it is the only South Indian Hindu temple in Singapore that is exclusively dedicated to Sri Krishna and his consort Rukmini. But you will find other deities in the temple grounds. The gopuram is not the usual multi tiered design, but is double-sided and decorated with statues studded with semi-precious stones. It is an agamic temple where the main entrance is shows the 10 incarnations of Vishnu, with a wedding scene and and Vishnu’s mount, Garuda. Note: A small fee of S$3 is asked for photography and S$4 for video camera use. When Sri Srinivasa Perumal Temple was first built, it was surrounded by a pond with a river running through it. Running water is important for Hindu cleansing rituals, so the location is of prime importance. While the waters have disappeared, it is still an important complex and acts as the start for the infamous annual Thaipusam festival to thank Lord Murugan. In this festival devotees pierce their tongues and cheeks with large metal skewers to support kavadi or cage-like constructions that are decorated with wire and peacock feathers. From Sri Srinivasa, they make their way to the Chettiars’ Temple on Tank Road. The exterior of the temple uses the gopuram style where the five-tier structure depicts the various incarnations of Lord Vishnu. While the building is one of the oldest temples in Singapore, receiving national monument status in 1978, the gopuram was added fairly recently in 1966. It was donated by philanthropist and businessman P. Govindasamy Pillai. The temple is dedicated to Vishnu’s incarnation, Krisha (or Perumal) but you will find statues of various other deities inside like Perumal’s consorts Lakshmi and Andal, and his bird-mount, Garuda. Not that Krishna is painted in blue, signifying his blue-blood. When you look up at the ceiling, you will see a beautiful painting of the nine planets of the universe. Sri Srinivasa Perumal also offers Thevaram classes, homeopathy services and participates in Project Bhakti which provides Hindu education for youth. As the temple is in colourful Little India, use our guide to explore the region further. And don’t miss the eccentric Mustafa market! Combine your visit with Sri Veeramakaliamman Temple for a well-rounded temple experience. If you want to visit during Thaipusam, you will have to check the date as it goes according to the Tamil lunar month that corresponds to late January or early February. Sri Thendayuthapani Temple, also known as Chettiars’ Temple after the Nattukkottai Chettiar community that built the temple in 1859, is an important place of worship for the Singaporean Hindu community. It was gazetted as a national monument fairly recently in 2014 and is dedicated to the six-faced Lord Subramaniam. During Thaipusam, the colourful Kavadi Attam procession that starts at Sri Srinivasa Perumal Temple all ends at Sri Thendayuthapani. So you can expect thousands of devotees, pierced in all areas during this festival of gratitude. The Alangara Mandapam (decorated outdoor hall used for public rituals) used on auspicious days and festivals is beautifully adorned. The large interior is bathed in golds, browns and whites where you are transported to South India. On particularly special days, like Guru Poojai and Karthigai, the temple provides annadhanam (free lunch). So you can join in the festivities while pleasing your palate with traditional Nattukkottai Chettiar eats. Check their calendar for important dates and upcoming events. Hong San See Temple and Fort Canning Park are both nearby. Although Sri Veeramakaliamman Temple was built in 1881 by Bengal labourers from north India (as folklore states), the architecture follows the Tamil and Dravidian style of the south. You can therefore expect the usual multi-tiered and intricate gopuram at the entrance to the compound. It shows Kali, to whom the temple was dedicated, in all her incarnations and is 18m high. In the early days, Sri Veeramakaliamman was known as “Soonambu Kambam Kovil” or Temple at Lime Village, as a lot of the devotees worked in lime kilns as lime was part of the mixture used for buildings back then. As the temple is dedicated to the Hindu goddess Kali, destroyer of evil forces, and some say that the deity protected the temple and its devotees during the WWII bomb raids, as the temple was left unscathed. Veeramakaliamman, meaning Kali the Fearless, was also a place of refuge for immigrants that did not feel safe in their new home. Inside, there are a multitude of statues of Kali in all her incarnations. They depict both her fierce power in gruesome detail to her motherly abundance, loving and caring for her sons Ganesha and Murugan. As the temple is in Serangoon Road in Little India, you can combine your visit with Sri Srinivasa Perumal Temple. Address: 141,Serangoon Road, Singapore 218042. 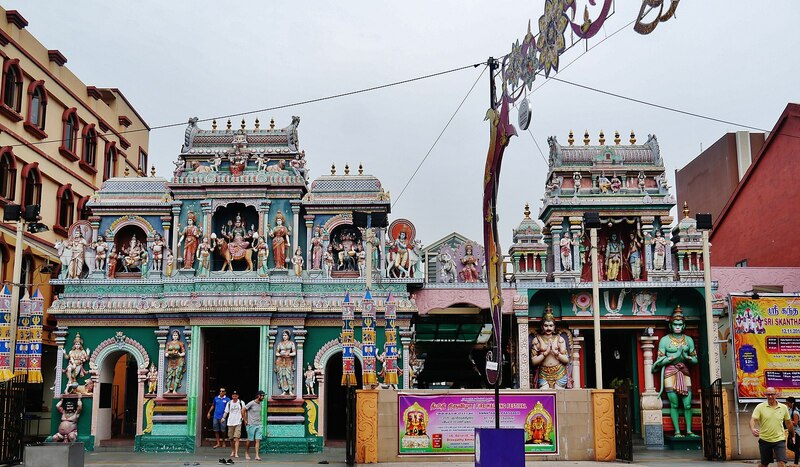 Not to be confused with the more famous Sri Mariamman Temple in Chinatown, Sree Maha Mariamman in the northern Yishun area is worlds apart in design. In a past life, and past location, the temple was pink in colour. 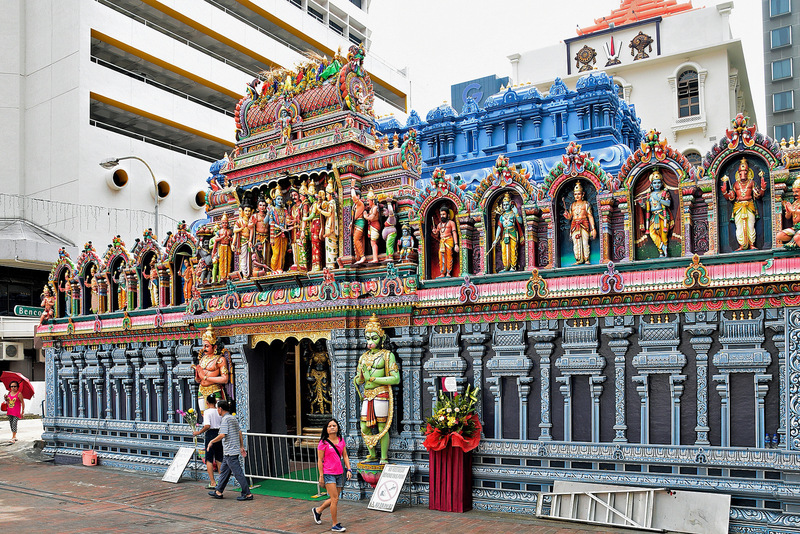 Today, the Hindu temple in northern Singapore has a flat golden exterior that stands apart from the usual multi-coloured gopuram of other Hindu temples. The temple has moved multiple times and has gone through various incarnations since its establishment in the 1930s. Yet it still acts as a pillar for the Yishan and Sembawang communities, helping to establish grassroots organisations and conducting charitable work for the entire community. As the temple is in the north, it’s quite a peaceful getaway from the rest of the city, so come here for a day of solace and self-reflection. 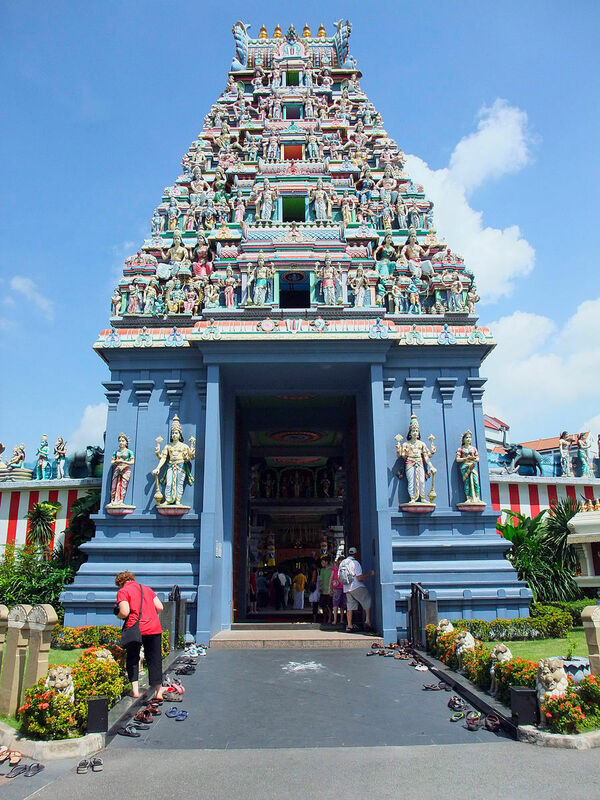 Sree Maha Mariamman Temple is close to both Malaysia and Punggol island if you like the idea of renting a bicycle in Singapore and riding the North Eastern Riverine loop. It’s also close to some of the best beaches in Singapore like Pulau Ubin, Pasir Ris and Changi Beach Park. It can also be included as part of the Yishun Sembawang Heritage Trail. Sri Senpaga Vinayagar Temple is by far one of the most unique and beautiful temples in Singapore. Years of hard work from multiple artists were put in to create this epic structure in Ceylon road in Joo Chiat between Geylang and Marine Parade. In fact, this labour of love took 20 Indian artisans 20 years to complete this masterpiece. The four golden pillars show Ganesha, the temple’s chief deity, in 32 poses. The rajagopuram (shrine of the main gateway) is one of the largest in Singapore, measuring 21m in height. It was gazetted as a national historic site in 2003 due to its historic significance and importance to many Ceylonese, or Sri Lankan Tamils, that have lived in the area for decades, hence the name Ceylon Road. The temple started out as a small attap shed which housed a washed up statue of Vinayagar (Lord Ganesha) by a Senpaga tree that was found in a stream (hence the name of the temple). Today, the temple is a fine example of southern Dravidian style architecture with large doors and dragon residing on the roof along with many other deities designed and carved by G. Radakrishnan, a traditional temple architect, in 1971. Another unique structure that was added in August 2009, is the 4.5-metre musical pillar that produces a melodic sound when tapped. It is the first of its kind in Southeast Asia. 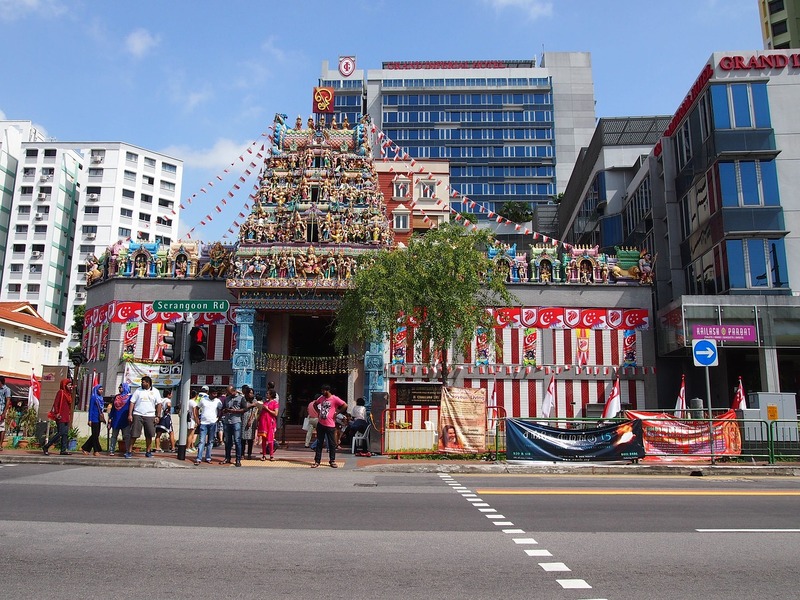 Sri Vadapathira Kaliamman Temple is another religious Hindu site in the popular Little India neighbourhood and is close to Race Course Road, Balestier Road and Serangoon Road. It is therefore very close to Sri Srinivasa Perumal Temple, Sri Veeramakaliamman Temple, and Sakya Muni Buddha Gaya Temple. The main reason why there are so many temples in this area is due to the water that once flowed freely throughout the region. It is believed that the temple was started by a single female devotee who placed an image of Amman under a banyan tree near the current temple in 1830. Similar to Sri Veeramakaliamman Temple, Sri Vadapathira Kaliamman is dedicated to Kali, the Destroyer of Evil, and other deities include Vinayagar (Ganesha), Murugan (Kartikeya) and Ambal, with many other colourful statues within. The figures are bright, as is usual with Hindu temples, making it a vibrant temple to peruse. The standout sight at the temple is the elaborate vimana, a stepped pyramid-shape tower that stands over the main shrine, that is adorned with deities. Due to its height, devotees can worship the deity from a distance. You should also visit to see the carvings, especially on the vimana (domed structure within the temple) as they are some of the most beautiful examples of temple artwork in Singapore. It is also said that there is a very popular Shirdi Sai Baba (Indian spiritual master) who is visited by devotees every day, but we cannot confirm this. Arulmigu Velmurugan Gnanamuneeswarar Temple (AVGMT) in Sengkang near Punggol recently underwent a year-long renovation that finished in March 2018. The name is a mouthful and is an amalgamation of three Hindu temples being the Arulmigu Velmurugan Temple, the Sri Krishna Bhagwan Durga Parameswari Devasthanam and the Sri Mariamman Muneeswarar Temple. So you can imagine the scale of the temple grounds. The new building houses and 24m dome, which is believed to be the brain of the building. A unique ritual was conducted to close the dome called Brahmaranthira Sthaapanam, where precious gems and metals are placed at the top of the structure. It symbolises the closing of a newborn’s crown which completes its growing process. The gems and metals are said to create a magnetic power for the interior. So it’s best to visit yourself to test out the theory. In 2004 another unique ceremony was held were 1008 conch shells were placed at the base of the structure. The conch shell has deep symbolic importance and is said to bring prosperity. Dance classes, as well as Thevaram, Carnatic music and yoga classes are held in the temple compounds. There is also a heavily subsidised, multi-denominational pre-school that teaches Hindu and Buddhist belief systems. 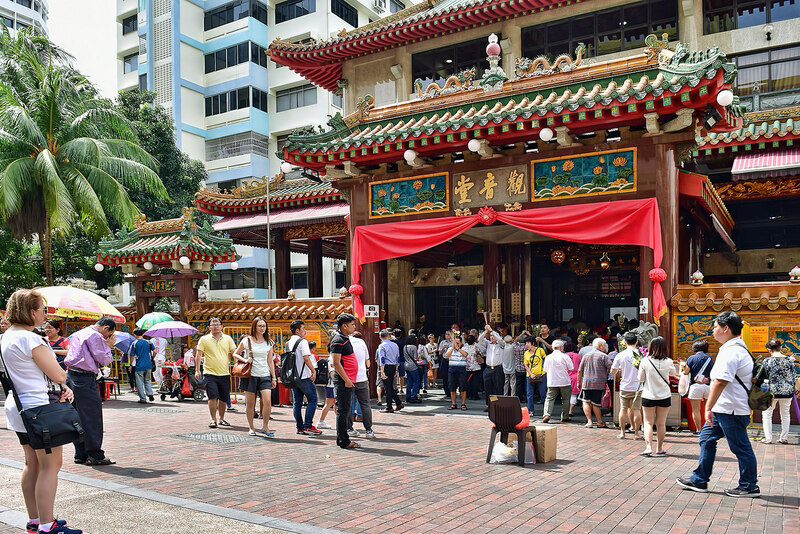 The temple works with neighbouring Buddhist temples Chong Ghee, Kampong Tengah Thian Hou Keng and Chong Hua Tong Tou Teck Hwee whose members participate in each other’s festivals. They are also part of Project Bhakti. Geylang has some of the best hawker centres in Singapore, and it is also home to Sri Sivan Temple. Before ending in Geylang in 1993, the temple was situated in Orchard Road (as early as the 1850s) and Serangoon Road for about 10 years. Today, the majestic structure is like no other in Singapore. It was even designed to be unique and authentic, where well-known temple architects form India were consulted with. 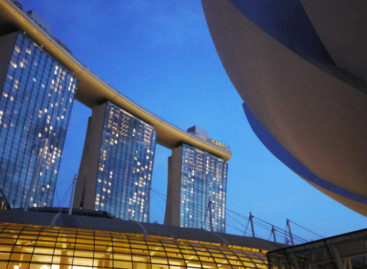 The structure draws inspiration from both the north and the south of India and an octagonal shape was chosen which is four and a half times larger than its original spot in Orchard Road. The design is a step away from the usual bright colours from other Hindu temples. It has calm, muted tones on the exterior and large, open halls on the interior. The blend of various designs is a testament to Hindu architecture and its focus on innovation that caters for a variety of deities and communities. This may very likely be the first time you are visiting a Hindu or Buddhist temple in Singapore and should know the proper decorum when visiting. If you have been before, it’s always good to brush up on your knowledge. So here are a few pointers for visiting the most beautiful temples in Singapore. Dress appropriately when entering any temple. Some temples will have their own restrictions and rules such as covering parts of your body or taking off your shoes. As a rule of thumb visit the temples with your knees and shoulders covered, no matter what your gender. Ladies are suggested to wear closed shirts. While some temples allow free entrance, donations are always appreciated. You do not have to believe in the different religious aspects that the temples teach, but the monks and devotees usually live only on contributions from outside sources. If you enjoyed looking at the beautiful temples in Singapore, why not skip a coffee and donate that money to a worthy cause. Some temples will allow photography and videography, others will charge, and a few will ask for a contribution. Please be aware of what you may or may not photograph or video. Also note that some visitors will be praying and prefer not to be photographed, always ask before taking a picture of a person. Try to research the different festivals, holy days and prayer times of each temple. You may or may not want to visit during these busy times. You may not even be allowed to enter some temples during prayer time, so be prudent.